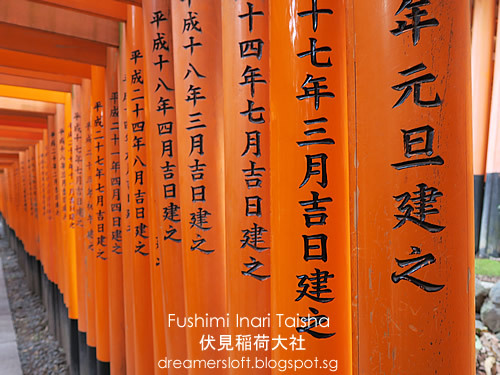 Fushimi Inari Taisha (伏見稲荷大社) is a must-visit place for me this trip. 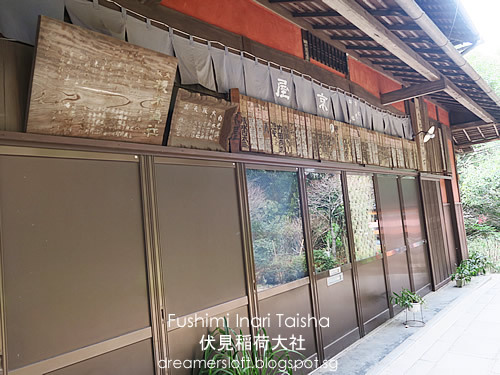 Previously we had always went to Kiyomizudera, Kinkakuji, Ginkakuji, but missed out on Fushimi Inari, or rather I didn't know about it until the recent years. 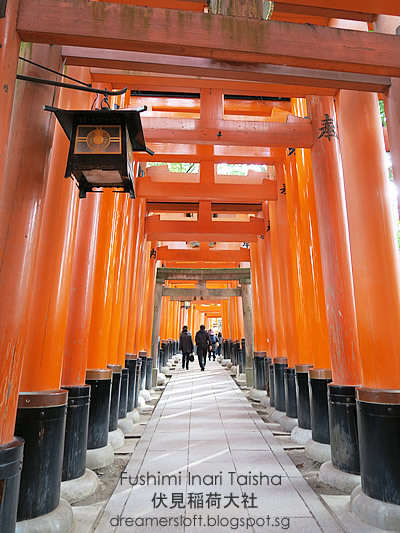 I learnt that Fushimi Inari is an important Shinto Shrine in southern Kyoto, famous for its thousands of torii gates, leading into the forest of Mount Inari. 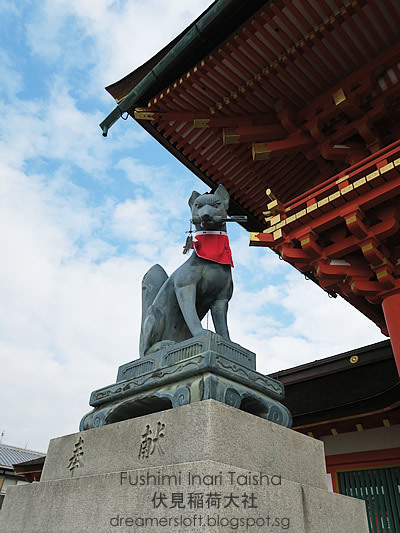 The shrine is dedicated to Inari, the Shinto god of rice and as foxes are thought to be Inari's messengers, there are many fox statues around the grounds of the shrine. 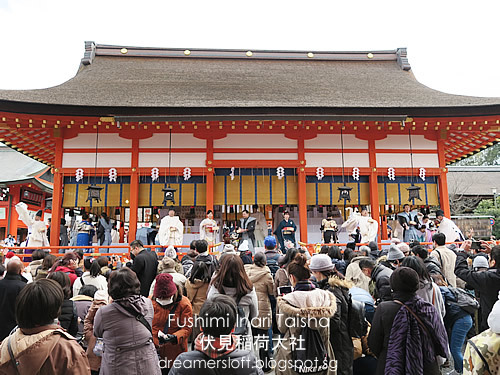 The day we went to Fushimi Inari was 3 Feb, which happened to be Setsubun (節分) meaning "Seasonal Division", signifying the beginning of spring. 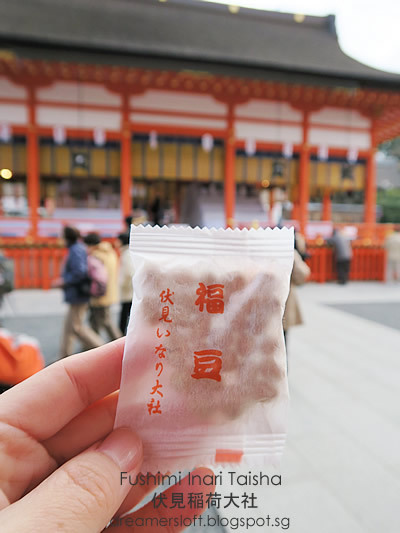 At Buddhist temples and Shinto shrines, there will be a special ritual called mamemaki (豆撒き) by the Priests and invited guests where they would scatter roasted soybeans called "fortune beans" (福豆 fuku mame). 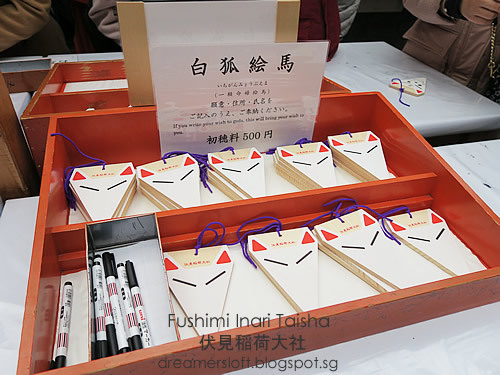 This is said to cleanse all the evil of the former year and drive away disease-bringing evil spirits for the coming year. 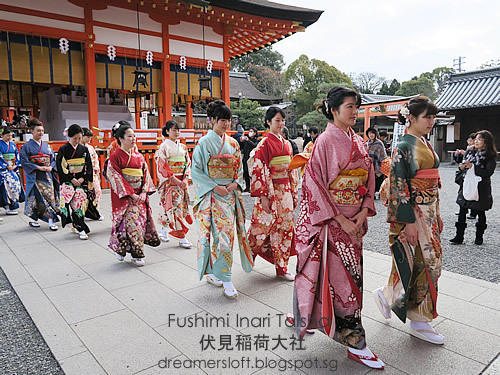 These lovely ladies in Kimonos were the invited guests to help scatter the fortune beans. 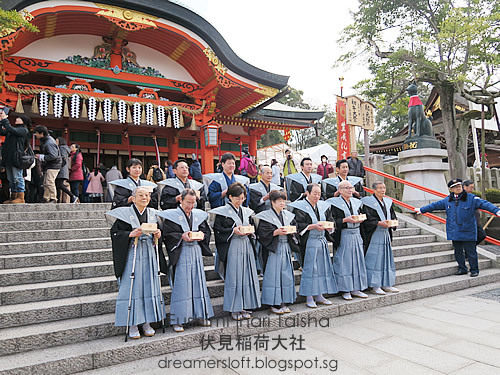 The Priests who were administering the ritual. 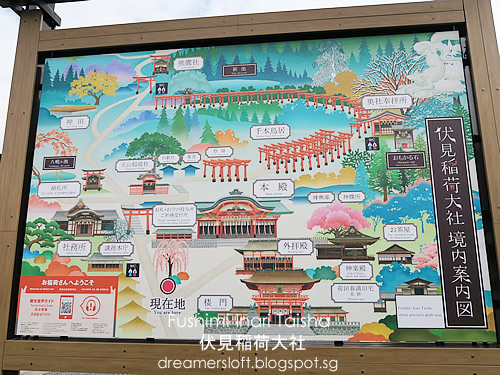 Map of Fushimi Inari. It would probably take an hour or two to climb all the way to the summit. 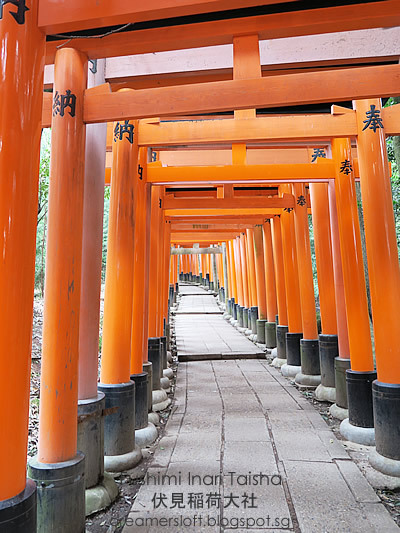 The torii gates are located behind the main grounds of the shrine. 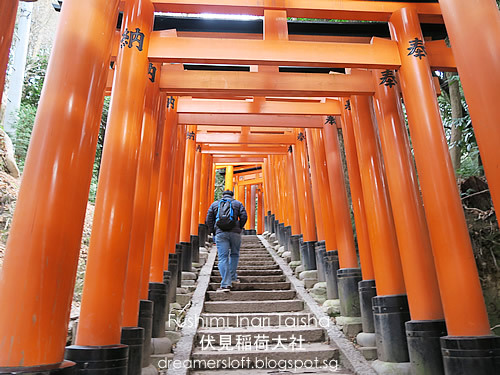 It was really crowded with narrow paths and impossible to take any photos without the large crowd photobombing. But we walked further and further, the paths became more spacious and the crowd dispersed considerably. 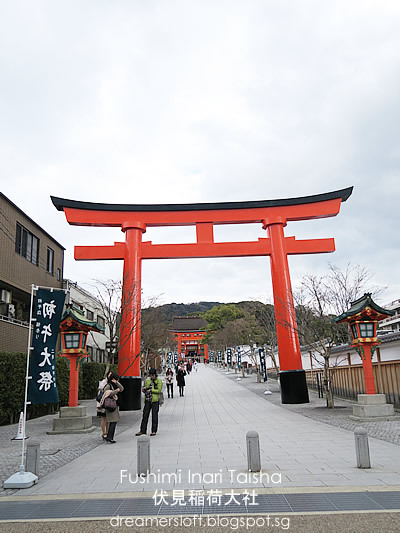 The right side of the torii gates indicate the year and month the gate was constructed. 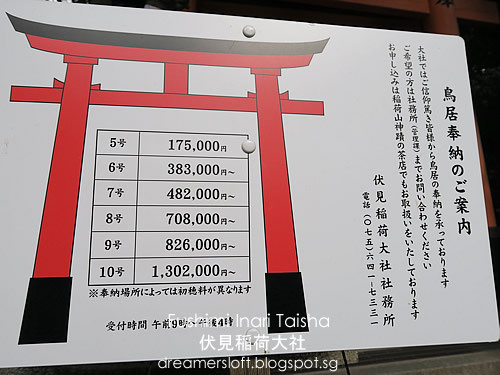 Here's the donation chart if any company or individuals wish to erect a torii gate for blessings. 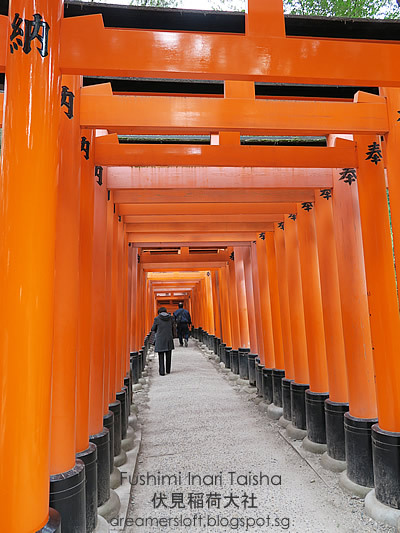 It felt serene to walk through rows and rows of the vermilion torii gates, where there was no crowd and the air was cold and crisp. 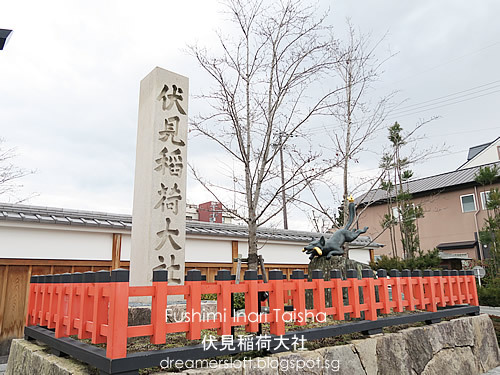 Names of the company or individuals who made the donations were imprinted on the left side of the gate. 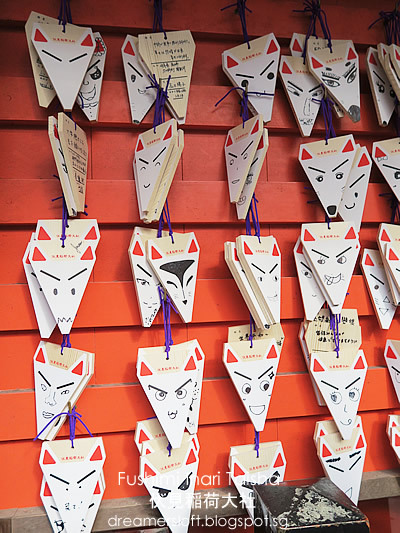 It's common to see this in Shinto Shrines, where temple goers could write wishes on a piece of wood and hang it up for blessings and pray that the wishes would come true. 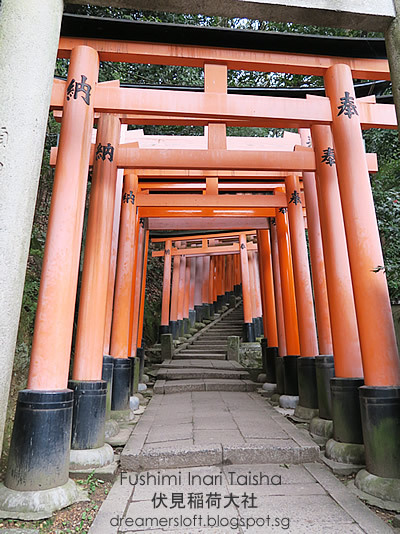 As we walked further uphill, could see that the torii gates looked older and more spaced out. 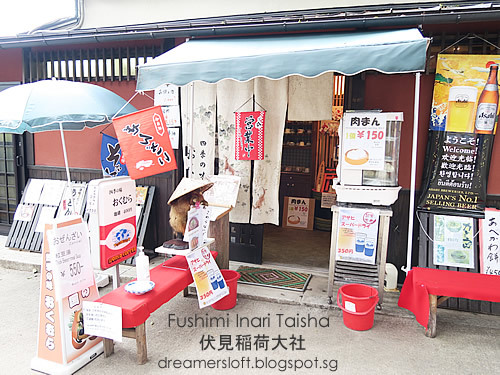 Finally we arrived at an area where we could enjoy some udon and inari sushi, but the eateries were all closed :( Not sure if it was because of the Setsubun or they only open during weekends? The kiddo was complaining of hunger and we were pushing him to keep climbing for the udon. Oh well. 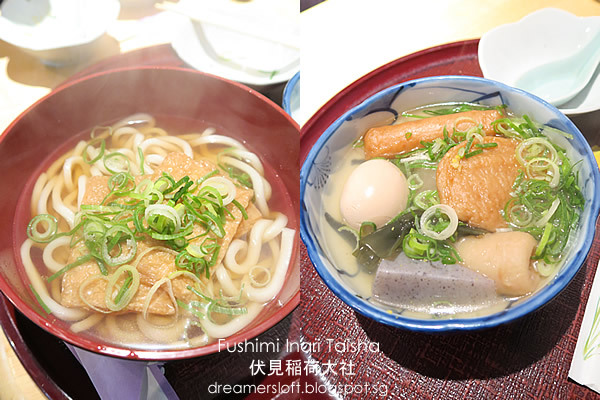 Yay, and we enjoyed our well-deserved inari udon and oden udon after one and a half hours of uphill hiking. 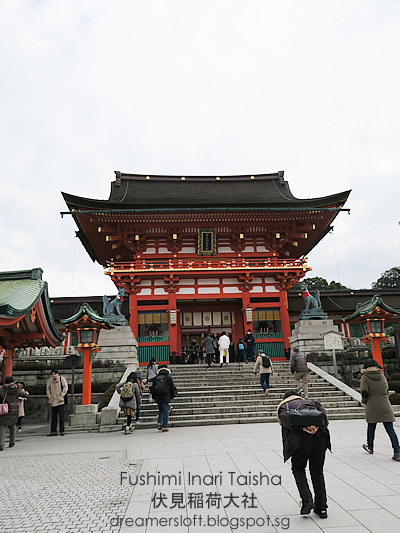 The best was yet to come because upon exiting the shrine, we saw an open-air food street to the right of the shrine, along with some shops. Yay, time for more food and shopping! Not sure if the food vendors were permanent or only during festive seasons? Cold weather called for meat! 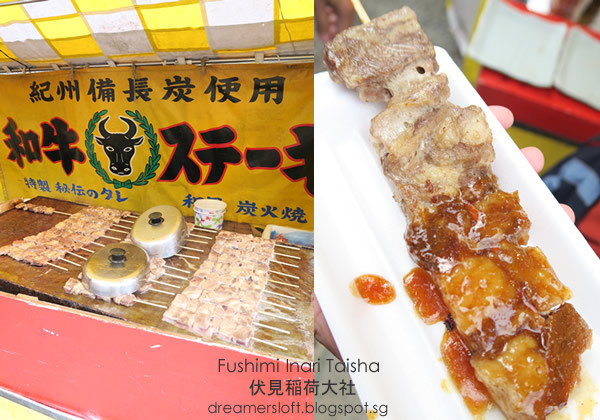 This yakitori with a sticky sweet teriyaki sauce was sooooo yummy! 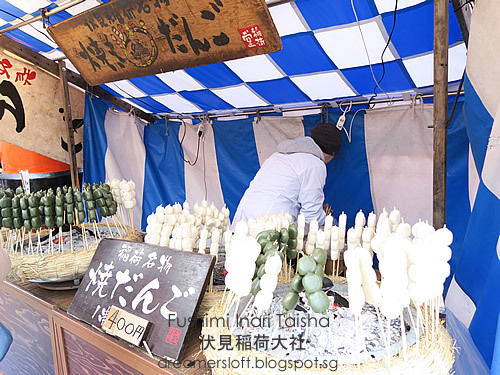 Takoyaki, also perfect for the cold weather! 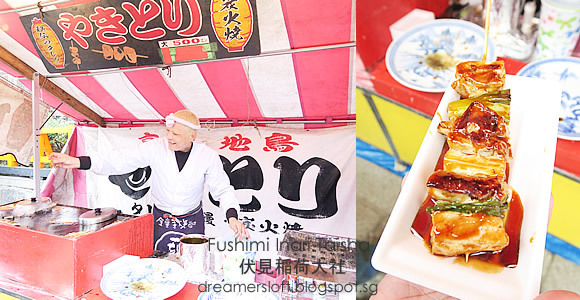 Tempted to try the Okonomiyaki but the portion was too big. Grilled beef! Unfortunately the cut was of lower quality and the meat too tough. OMG! 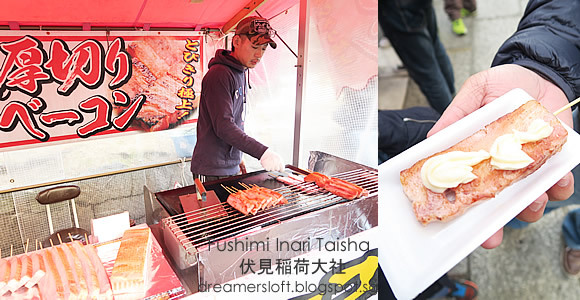 This grilled bacon with mayonnaise was da bomb! 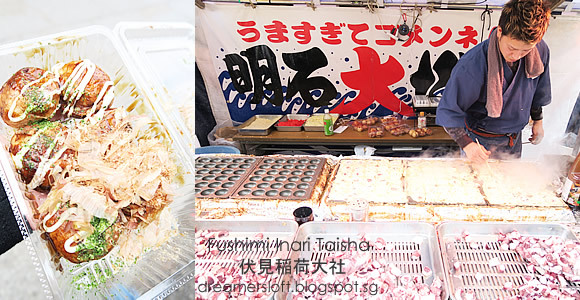 The pork was salty and greasy, smelled and tasted so good! 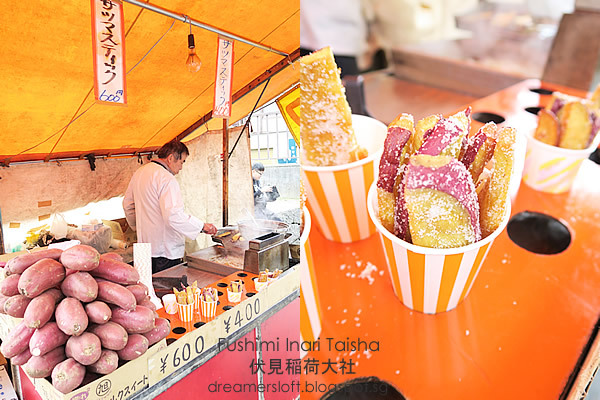 This grilled sweet potato coated with sugar was super yummy as well, and we just had to get seconds. 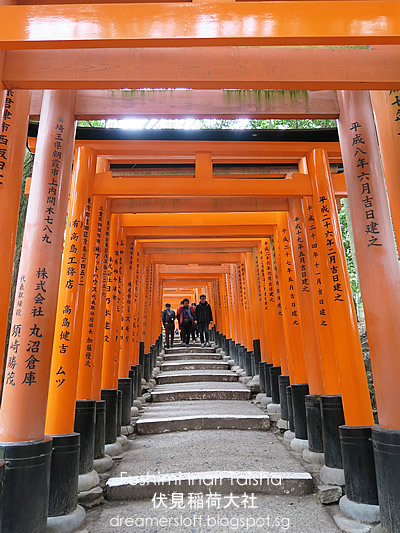 Overall, the Fushimi Inari Taisha was a lovely shrine to spend the morning, be sure to walk further uphill to get away from the crowd and truly enjoy the peacefulness of the mountain. 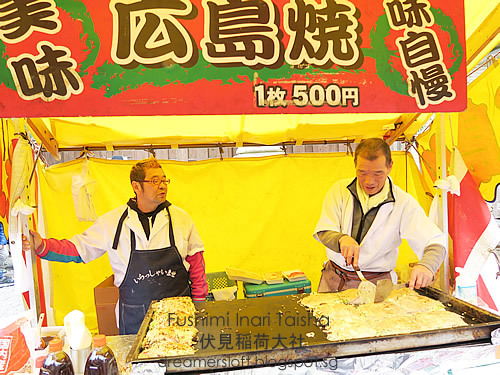 Thereafter, it's befitting to enjoy a nice hot bowl of inari udon or some street food to complete the experience. 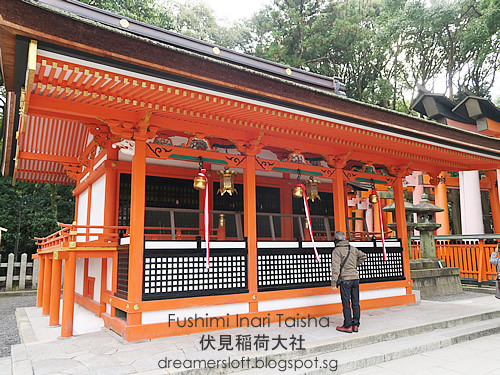 Stay tuned for Part III - Plum Blossom viewing at Tenmangu Shrine.